A recent snow and ice storm that hit the southern states has made me appreciate our road crews and the work they do to keep our roads safe during winter weather. When the forecast calls for snow/ ice in our area the salt trucks are out in full force preparing the roads so people can travel more safely. It is sad to see what happens to people in cities like Atlanta when cold weather leaves motorists stranded for 18 hours. We can plan and prepare to the best of our ability for weather situations but Mother Nature has been known to surprise us. 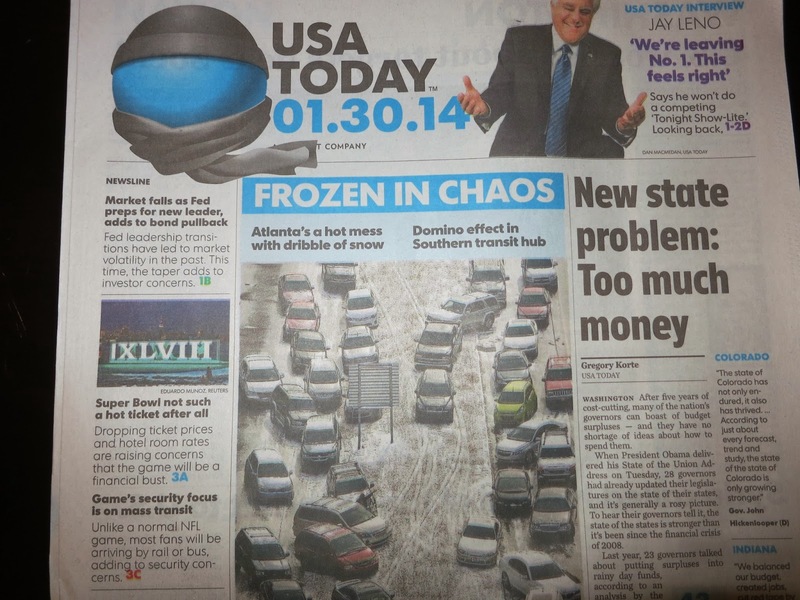 USA Today front page news story about the Atlanta storm. Because weather forecasting in an evolving process we have emergency weather plans so we can take the best care of our cattle as is possible. This includes having plenty of feed ingredients on hand much like people will stock up on grocery items like milk and bread when bad weather is in the forecast. 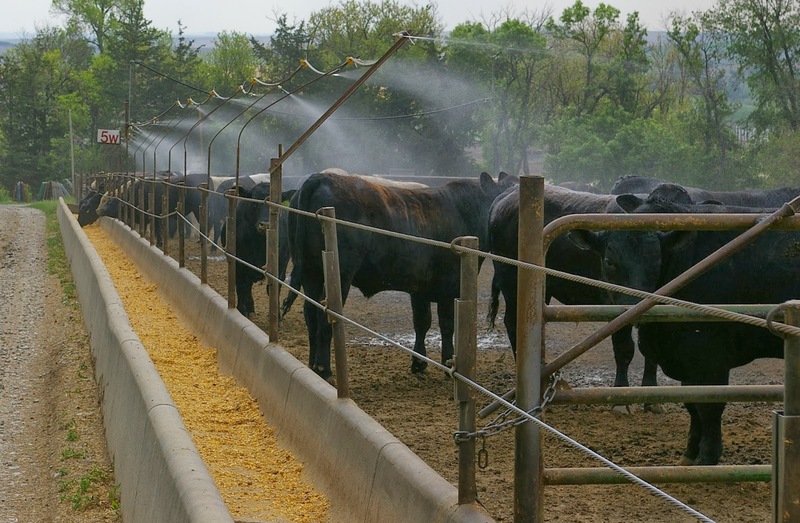 We also continually work at keeping cattle pens in shape and machinery ready to go. This winter we have not received much snow so the pens have been easier to take care of. You can see the cattle resting comfortably in temperatures around zero. In the upper left of center you can see the steel windbreaks. The pen in front of me has a windbreak of trees Steve and I planted in the early 80’s. Cattle that live outside adjust to the weather. They have a thick hide (we know it as leather) and grow hair that insulates their bodies for colder temps. In Nebraska we also get strong winds so the wind chill is a factor in designing cattle pens. We seek to provide pen conditions that keep them as comfortable as possible. Many of our pens utilize windbreaks from trees we’ve planted in the early 1980’s. Other pens utilize windbreaks made from steel for similar protection. get out of the wind and the bedding provides added comfort. Because we have had so much cold with high winds we have had a tougher time keeping water tanks open. We chop open the ice with an ax. That job is a little hard on my back so it has been Steve’s job this winter. 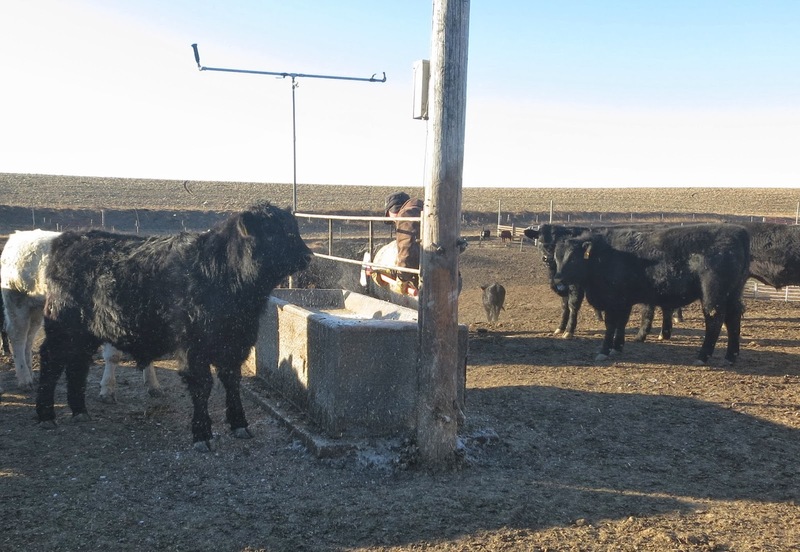 Generally the cattle drink throughout the day to keep the water tanks on. Angus steer looks on. Notice the thick fur on this steer. The Atlanta storm is a great reminder to me about the dangers winter weather can bring and the need to be prepared. We have learned that Mother Nature is not perfectly predictable. We strive to prepare for the worst and hope for the best! The certainty we have is that the weather will change. It won’t be long before the heat of summer arrives and we will be putting up sprinklers to keep the cattle cool. it won’t be long before we are working in much warmer conditions.